This best-selling meditation book for those in recovery offers daily thoughts, meditations, and prayers for living a clean and sober life. 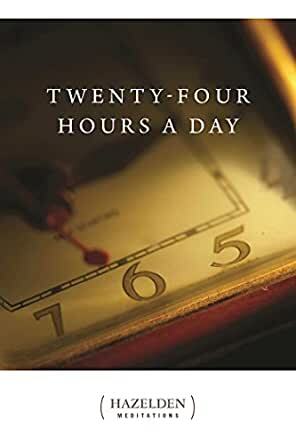 Since 1954, Twenty-Four Hours a Day has become a stable force in the recovery of many alcoholics throughout the world. With over six and a half million copies in print (the original text has been revised), this "little black book" offers daily thoughts, meditations, and prayers for living a clean and sober life. A spiritual resource with practical applications to fit our daily lives. "For yesterday is but a dream, and tomorrow is only a vision" is part of the Sanskrit proverb quoted at the beginning of the book which has become one of the basic building blocks for a life of sobriety. In addition to a thought, meditation and prayer for each day of the year, this handy, pocket-sized volume also contains the Serenity Prayer and the Twelve Steps and Twelve Traditions of Alcoholics Anonymous. It is a simple, yet effective way to help us relate the Twelve Steps to everyday life and helps us find the power not to take that first drink each day. There is a lot of controversy over this book in AA as it is not conference approved. This book came about from the notes of a member of the Oxford group which was basically a prayer group that Dr. bob attended with Henrietta Siberling for 2 years before he got sober. Bob and Ann Smith attended this group for 2 years never admitting his alcoholism even though that and his financial troubles were well known to the group. One day he admitted to the group he could not control his drinking and they prayed over him, 2 weeks later Bill Wilson rolled into town. There is a lot of wisdom in this book and as AA 12 steps was built on the 4 steps of the Oxford group, I feel it cannot hurt to read this. The Oxford 4 steps were 1. Abandon yourself to God. 2. Make a written moral inventory. 3. Make restitution for harms done. And 4. Work with others. Sound familiar, this is all documented by Gail who started the archives of AA and her lectures on history of AA can be found on AA Podcasts. Another book I highly recommend is the little red book written 10 years after the big book and really gets into the 12 steps in more detail than the 12 and 12. Good luck and I wish you all the best as you trudge the road of sobriety. I’m not going to preach any A.A. doctrine to you. Either you already know what this book is about or you don’t. I read a quote some time ago that said “do something today that your future self will thank you for “. Stuck with me. So a few years ago I did. And I thank me for doing it every day. If you’re thinking about buying this book, I would say go for it. Good stuff. This little black book is really something else. I've been going to alanon meetings for about 2 weeks now and my sponsor wants to wait a month before starting my steps. The thing you quickly learn in alanon is that although you may not have a drinking problem, we are still sick with the disease of alcoholism. My loved one is currently in rehab and I just knew I had to do something for myself. I'm learning how to find inner piece and this book (along with others) has been amazing. My only qualm is that it does reference God a lot and that's not really my thing, but I can easily get past that and look at the true message. I have used this book for 8 years and will eventually have to get a new one for myself. I give them to other folks in the program as it has been my mainstay, especially when I was unable to attend meetings as often as I wanted. I like that it gives a daily meditation, which I live and breath for. It sets me on the right track for my day, and teaches me to internalize the messages in recovery. Used properly, it can be a worthy tool for maintaining one's sobriety. Even though the readings remain the same I get something new every year from the daily inspirations, and this book has spoken to my needs of the moment more times than I can count. It is truly a God-given hand to be held in the face of life on life's terms. Too big, I should have paid an extra dollar or two for a smaller one. This is a full page size book and I would love a smaller one to keep in my purse. The words are irreplaceable though!